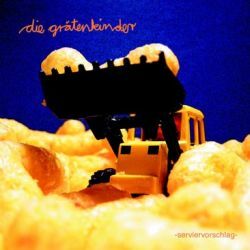 Their EP Wo du wohnst has already been a welcome appetizer for the second official CD by Die Grätenkinder. On 12 songs, mostly less than 3 minutes long, the German quintet plays a very entertaining kind of indie pop rock, with all of the songs able to keep more or less the same high level. On their homepage, Die Grätenkinder consider themselves as a schnarrrock band. This is not only a beautiful word containing three consecutive r's, but it's also their definition of a mixture of noisy beat guitars, melodic punk and diskurs pop inspired by the Hamburger Schule. A major difference between Die Grätenkinder and other indie bands is the dominant use of organs. Song writing and vocals are also impressive and astonishingly catchy. As it was already the case on the preceding EP, I again draw parallels to Sportfreunde Stiller and Boxhamsters. There is the dynamism and power of Sportfreunde Stiller, but also the sadder and more emotional parts of Boxhamsters. Finally the interesting lyrics are about the small problems of everyday life. It's a bit a pity that Serviervorschlag is so short, but that prevents it from containing weak parts. Die Grätenkinder have convinced me again very much.